We've been having fun over the last few weeks - and as a result we hope that you will too. The acceptance and popularity of our 3-pack cigar specials, and of the selections we sold in December, prompted us to see how we could expand on this idea. But we didn't just want to work on the price. We wanted to make each selection "interesting" beyond its price. After some careful study we have come up with 7 selections of mixed brands - covering some of the most popular sizes, plus selections for a dinner, a weekend and, for even more variety, a 5-cigar International selection in a wooden travel case. Each selection has its own descriptive leaflet included. In 1998 "San Cristobal" was launched in Cuba and was considered to be the best of the modern Cuban brands. All very interesting, but not as interesting as the cigars themselves - and the composition of the selections. For example, the Half Corona selection chosen for the short 25-35 minute smoke contains a classic half corona (102mm x Ring 40) but for those who find the ring 40 just a little too slim we include two "long (110mm) Half Coronas" which may possibly be better described as "short Petit Coronas" since they are slightly thicker at Ring 42 - a 2/64 inch (0.8mm) thicker diameter that may make all the difference. Try it and see. Our selections give you the opportunity to compare cigars with other like-sized cigars, or offer a variety of cigars to be smoked at the appropriate times. Take the advantage and have fun! PS. Another modern Cuban brand is the all perfecto range "Cuaba", the largest of which will be the main cigar at our Cigar Dinner in Johannesburg on June 3. If you can't make the dinner, look out for the 3-cigar offer afterwards. You can read previous articles from "Across the Counter" in The Library. The days are shortening, and there is that definite inclination to postpone leaving a warm bed. Winter is coming and for much of South Africa this means drier air. This is not good news for your pipe tobacco. You may need to take a look at how you store your tobacco and, as important, how you carry it around with you. Storage can be quite simple. Any airtight container will do - with a moisturising agent (such as a piece of damp sponge or cotton wool) attached to the lid. Better still drop in one or two Humydroles®. When you are travelling around, even short distances, your tobacco is more vulnerable to the dry air. Once you have broken the seal on the original packet it never really closes airtight again. Also, after a few days, the packet will start to look shabby - which is not part of the pipesmoking ethos. You'll appreciate the advantages of a tobacco pouch. A Pipe Bag - for travelling with 2 or more pipes. And they all have rubber type linings which can't absorb moisture from your tobacco. Naturally, some moisture will evaporate when the pouch is open while you're filling your pipe. The ideal product to use to replace this moisture is a Humydrole®. This little item has the ability to absorb an amazing amount of water, which it releases as moisture over a fairly lengthy period of time, keeping your tobacco fresh, and enjoyable to smoke. But in the colder areas - what if your tobacco gets too hot? If you live in that well known part of South Africa where it is cold and wet in winter, you may not need a Humydrole®, but do be careful not to store your tobacco near a heater or the fireplace. If the tobacco gets too warm in a closed container (including your pouch), mould may start to develop. This could render the whole batch suitable only for compost. Winter or Summer, the general rule for preserving tobacco is: keep it cool and slightly moist. You already have a pouch?? Then buy a Humydrole® and we'll give you a bundle of bristle cleaners - FREE! There may be frost on the grass in the early morning but for many parts of the country Winter spells out dry air. This is not good news for tobacco products, especially cigars. If you haven't checked your humidor or cigar storage area recently I suggest you do so now. The relative humidity should be around the 70% mark, but feel the cigars - they will tell you more than the hygrometer. If they are starting to harden and lose their sponginess they are asking for more moisture. Check that your humidifier is filled and that the holes in the face are clean. If they look a little blocked give them a brush. Also run your hand over the inside of your humidor. If it feels bone dry, remove the cigars and wipe the whole area with a damp (not wet) cloth. Allow the moisture to be absorbed and then return the cigars. If you have a large humidor, remember to rotate the position of your cigars on a regular basis. Don't suffocate those at the bottom. At our recent cigar dinner (June 3) a young man at our table said that in winter he augmented his humidifier by dividing off a section in his humidor and placing some damp oasis in a container in the space. This sounded like a practical idea - but if you do this, then feel the oasis occasionally to make sure it isn't getting slimy. Once you have the humidity under control check the surroundings of your humidor. Winter is the time for heaters to be switched on, sunlight to be allowed in and doors to be closed. Any of these, or a combination of these, can adversely affect your cigars. Make sure the storage area is cool - and with good humidity your cigars will be a real joy to smoke on a crisp evening in front of the fire. Talking of the Cigar Dinner - we had an over-booked function! The late bookings sat in an alcove overlooking the other tables - a good vantage point. The evening started with a glass of sherry (excellent on a bitterly cold night) accompanied by the small Vasco da Gama Capa de Cuba Cigarillo. The Cuban wrapper on this European cigar really does offer an exceptional degree of flavour. The guests were seated by just after 7h30 and while orders were being taken we moved on to a Romeo y Julieta Petit Corona - a well known brand and a most enjoyable smoke. Those who smoked their Cuabas over their desserts and coffee enjoyed a really sumptuous smoke - smooth and full of flavour. The vibe was, as usual, amazing. Put a few strangers together at a table with good food, wine and cigars and you soon have a table of friends - even if only for the evening. after selling extras on the evening. They will be available from Thursday, 24 June 2004. - the Cuaba alone sells for R164.00! If you are one of those lucky enough to be able to buy one of these packs, then you can look forward to a really good cigar dinner of your own. Pipes - the perfect "Cure"
"THE EARLIER SAV DRY FULL BENT YOU SENT,FULL OF FILLS ETC,IS THE BEST SMOKER I OWN,EXCEPT FOR THE STANWELL CALABASH YOU SENT AS WELL"
Your comment on the Dry System confirms our theory that the initial proper curing of the wood is intrinsic to producing a good smoke. Savinelli cures all the bowls as if they would end up at the very top of his range. The surface flaws and lack of close grain downgrades most of the bowls to varying extents, but these are really cosmetic flaws which don't affect the smoking quality of the pipe. I went on to refer him to the following article first published in 2001. One of the fundamental processes in pipe manufacture is the curing and drying process - the wood needs to be hard, clean and dry. The influence of this process on the final smoking quality of the pipe is significant. But it is a time-consuming process and is really only cost-effective for top quality pipes. So it will only be carried out properly by a manufacturer who makes a range of pipes right up to the highest quality - flawless bowls with plenty of hard wood and fine grain. Furthermore, most grading decisions are made only after the curing and drying process, once the bowls have been turned and the wood can be properly examined. So each pipe at each price bracket from a given manufacturer has had the same basic treatment as the top-of-the-range. Obviously flawless bowls or bowls with lots of hard wood and close grain will receive progressively more attention in the finishing processes than those with a majority of soft wood, a "vague" grain or obvious surface flaws. To illustrate this point we show a range of Savinelli pipes, all of the same shape (614), from the entry level "Capital"
to the"Punto Oro Fumée" - one of the most beautiful pipes we know. It follows that it pays to buy a pipe from companies such as Savinelli and Stanwell. The pipes at each higher price point will be successively higher grade - more hard wood, less surface flaws, more beautiful and closer grain - but they will nearly all provide good smoking quality right across the price range. Only R100 more than the standard quality!! An incredible price for a superb pipe - in quality and design. But here's the catch - we only have 8 pipes available at this price. What about a "Turbo" Cigar lighter? The way you light your cigar can make or mar your enjoyment. 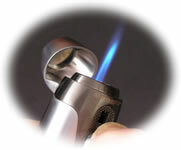 The Turbo / Torch lighter burst upon the cigar scene some years ago, and at the time we had our reservations about its reliability and super-hot flame. The strong, hot flame lights the cigar almost too quickly. A major plus however, was its ability to combat the elements - Capetonians swear by these lighters. Well the reliability of producing a flame without spraining your thumb through endless clicking seems to have improved, the styling is better and there is a wider range of prices - we now carry several models. I also understand, from comments by cigar smokers, that many have adapted their technique of lighting cigars with this super-hot flame. Simply holding the turbo flame further away from the cigar than you would a normal flame, and taking care to paint the whole foot of the cigar with the flame, has solved the problem of ruining the first few puffs by over-charring the foot. Guaranteed for 12 months - this is a great buy! Enjoy using it on your next trip to the bush, mountain, sea or golf course. PS A Turbo is not really suitable for a pipe, as it acts like a blow torch and the super-hot flame could burn the inside of the bowl. Any reservations we might have had about possible customer resistance to smoking a previously owned, refurbished pipe have been totally dispelled by the demand for these "Mature Pipes". The first collections just flew out, and it has taken time to put together another balanced selection. This time we have 16 pipes - mainly classic English pipes from Charatan, Comoy, Loewe and GBD together with others from Mr Mattner, Jeantet, and a splendid example of the artistry of Lorenzo. If you're on our database, you'll get a preview notice - an opportunity to add a real gem to your collection. If you're a DIY person, you might like to refurbish some of your own pipes. Here is a step-by-step procedure - it is very quick if done regularly. 1. Removing the build-up of tars and juices which collect inside the shank and mouthpiece, and in the base of the bowl. Work over a tray or dish lined with paper. Remove the mouthpiece from the pipe. Use a bristle cleaner dipped in a solvent (eg Savinelli Pipe Clean, or some form of alcohol) to really scrub the inside of the shank and mouthpiece. (You could pour just a little solvent into the base of the bowl and work the bristle cleaner through from the slightly tilted shank.) Try not to splash the solvent on the outside of the bowl or mouthpiece. Be careful not to start a hole in the base of the bowl through excessive twisting - and for very bent pipes go easy round the bend in the mouthpiece. You have finished when the pipe cleaner comes through clean. 2. Keeping the carbon layer under control. When necessary, ream the carbon layer inside the bowl to an even thickness of about 1.5mm (R1 coin) - the T-shaped reamer from Savinelli or the precise, high-tech Senior reamer will do the job comfortably. Wipe the inside of the bowl with a little of the solvent. 3. Polishing the vulcanite mouthpiece to remove the bitter taste. Remove the oxidation from the mouthpiece with a mild abrasive (eg Savinelli Stem Polish or Jeweller's Rouge). This might require vigorous and lengthy rubbing (a whole TV programme). If very dull and green, a buffing wheel is a big help - remove the mouthpiece to prevent accidental breakage. Take care not to buff too hard on one spot - the vulcanite may burn. If the logo is stamped on the mouthpiece it will possibly disappear. Watchpoint - water based cleaners or abrasives (eg Handy Andy, Vim) or alcohols (eg Meths, benzine) may add to the discolouration of the outside of the mouthpiece - extra polishing will be necessary. 4. Beauty treatment for the outside of the briar bowl. Polish the outside of the bowl with a wax polish (eg Savinelli Bowl Polish) and a clean cloth. Again a buffing wheel can help - remember to remove the mouthpiece before starting. Finally, leave the pipe to stand bowl down for at least 24 hours before smoking. NB Read about cleaning your Meerschaum - a very different process. 1. Don't oversmoke a pipe (especially your favourite) - it will become saturated and turn "sour". 2. Do rotate your pipes to allow each to dry out properly. 3. Do polish the mouthpiece regularly, don't let the oxidation get the upper hand. PS Do you have a pipe that you no longer smoke, or know of anybody else who does? It should be a pipe from a leading brand - Dunhill, Charatan, Savinelli, Stanwell, Comoy, Larsen, BBB, Orlik, GBD, quality Freeforms, etc. It should have its original mouthpiece and not have been battered. If you have a pipe you'd like to sell that fits this description, forward me the details (per fax, phone or e-mail). If it seems to be acceptable I'll ask you to send it to me for assessment and then either make you a cash or trade-in offer, or return it to you if I don't feel it is suitable. We'd like to continue building a good supply of "golden oldies" waiting to give pleasure to new owners.